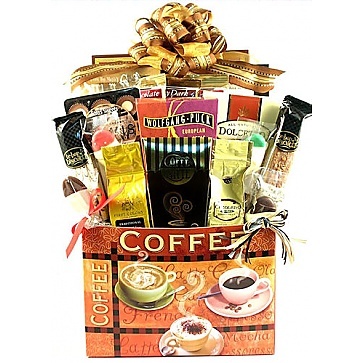 This gift basket offers is a latte delicious coffee treats and drinks for them to enjoy! The coffee lover on your list won"t be able to resist this deluxe gift arrangement that features a coffee themed designer box. This is one gift that will keep them up nights thinking about your generosity! The very nature of this basket makes it a relatively neutral gift basket that can be enjoyed by men or women. This a great corporate gift basket for clients or employees.